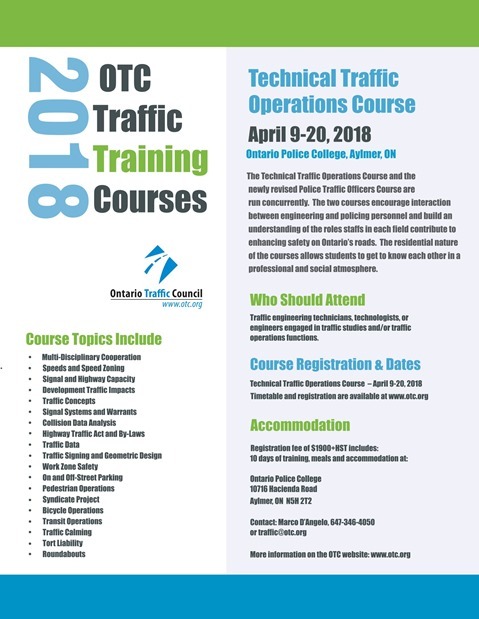 The OTC will be hosting its annual Technical Traffic Operations course at the Ontario Police College in Aylmer from April 9-20, 2018. The course spans the full range of key areas from characteristics of the transportation system, analysis of flow and capacity, traffic operations, traffic control devices, pedestrian/bicycle facilities, to collision data analysis and Intelligent Transportation Systems. The course curriculum is regularly updated to address current practices and new issues and is instructed by a team of expert practicing engineers, academics and other senior professionals. Students gain a solid, comprehensive understanding of the principles, and working concepts of all major areas of traffic engineering as they are practiced today. At the end of the course, students should be able to review a traffic issue and determine possible approaches to solve the problem. The residential nature of the courses also allows participants to get to know each other in a more social atmosphere. The fee for this course is $1900 + HST which includes all course materials, meals and accommodations. Please review all documents below and submit your application form to the OTC by office by fax (647-346-4060) or email (traffic@otc.org).